My summer in Armenia was an eye opening experience to say the least. 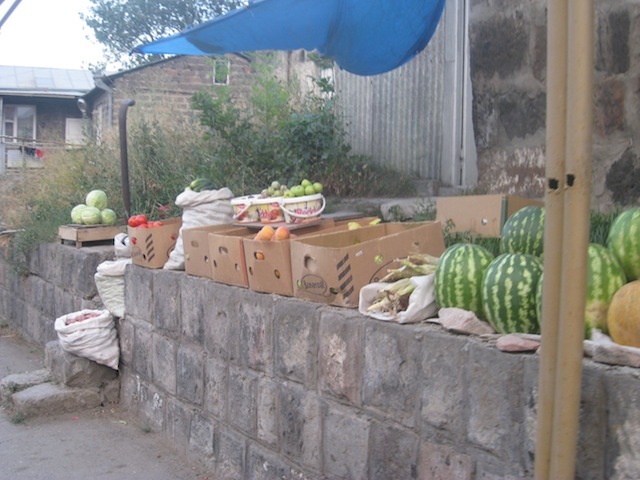 While Americans worry about the release of the latest Ipod or the new fashion trends of the season, Armenians worry about affording day-to-day necessities such as gas and water. As time progresses, it is becoming increasingly difficult to sustain a living, which has made staying in the homeland a difficult decision. Gyumri is Armenia’s second largest city after Yerevan. Don’t let this fact fool you, however. People in Gyumri are constantly struggling and are far behind compared to Yerevan’s city streets. Their worries include, but are not limited to, getting food on the table, affording electricity, and staying employed. 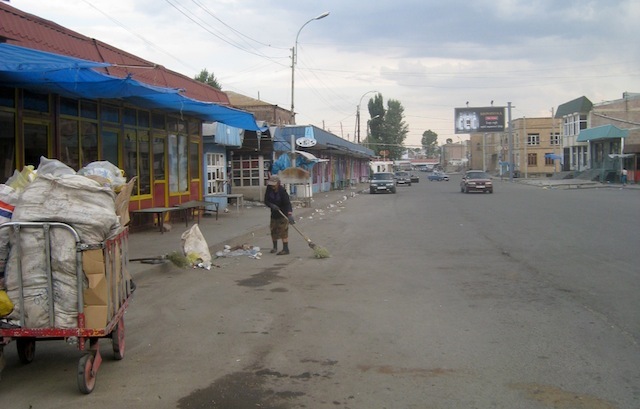 This harsh reality is visible on the streets of Gyumri where buildings are rundown, businesses are underdeveloped, and supplies and food in stores are minimal. Although difficult to believe, Gyumri was once a bustling city. The earthquake in 1988 and the collapse of the Soviet Union broke down this developing and flourishing city and made Gyumri unrecognizable to its citizens. During our Youth Corps trip, I sat down with Digin Lilig (our house mother) to get a better sense of life in Gyumri and to get an idea of just how much life has changed since the earthquake. After making sure we had a fresh cup of Armenian coffee on the table with chocolates and morsels on the side, Digin Lilig painted a picture of Gyumri before the tragic event. She began talking about life during the Soviet Union and how the socialist regime provided for the well being of all. No doubt about it, they were definitely under heavy suppression; individuals could not open businesses, the government placed strict guidelines on all rights and freedoms. People, she explained, could not advance in society because socialism required that everyone be equal. It came to a point where neighbors would be afraid to build higher fences on their lawns or redecorate their homes because all houses, for the most part, needed to be identical. No one tried to step past boundaries to advance and gain material wealth. Even with all of these detriments, Digin Lilig explained that in some ways, life during those times was easier. Socialism provided for everyone. Under the Soviet Union, the people of Gyumri were all employed and faced no fears of losing their incomes. Everyone received their paychecks in a timely matter and parents were comfortable knowing that their children would never go hungry. It was here where she emphasized the importance of the middle class during those times. No one would be living in a big mansion with riches while one was struggling in the streets. The fall of the Soviet Union and the devastating earthquake took a toll on the people of Gyumri. Digin Lilig explained how the fall of the Soviet Union left her family financially unstable. She cringed remembering the large sum of money her father-in-law had saved in the bank, which was all lost after the Soviet Union’s collapse. That money was hope for a brighter future and peace of mind. During our discussion, she went to the other room and brought back bank records of exactly how much money they had. To this day, she has kept those records, either to remember those times or with hopes of one day receiving that sum. After the conversion to dram (Armenian currency), Digin Lilig’s family was convinced that money would not be of use or value. Instead, her family decided to invest in cattle in order to ensure their livelihood. While others were left in shambles, Digin Lilig expresses how much gratitude she had for her father-in-law’s smart investment. Instead of worrying about money conversions, they owned cattle and felt more secure. When the earthquake hit, Gyumri turned upside down. Gas and light would only be allowed during certain hours, food was scarce and less than appetizing, stores shut down, and the help never seemed to reach those who needed it most. They felt completely alone and began to rely on one another. As she began describing those difficult times, Digin Lilig’s eyes filled with tears as she explained how the years after the earthquake seemed to last an eternity. Her youth, as she put it, passed before her eyes, and her now unrecognizable reflection in the mirror is hard to handle. With difficulty, she tried explaining the extent to which she and her family endured. As a young mother and father, Digin Lilig and her husband were not prepared to trade their content lives in exchange for worries and suffering. As the conversation progressed, Digin Lilig asked me to forget today’s Gyumri and imagine a place with working factories, furnished buildings that lined the streets, a bounty of foods and supplies in every store, and people walking around with a sense of comfort and stability. When I asked if the government provides aid, as it does here in America, she laughed. She seemed to treat my question as a joke. She made it clear that there is no government assistance and that neighbors depend on each other for help. When her neighbors are low on food, she prepares extra that day to share and vice versa. Children have a hard time going to school because they don’t own a simple pair of shoes. Instead of getting an education or kicking around a soccer ball, children are left to worry about their parents’ problems. The extremity of their conditions leaves young kids worrying about joblessness and the loss of their parent’s income. When I asked Digin Lilig about employment in Gyumri, an even harsher reality set in. The government expects payments before they employ an individual. Meaning, before money is earned, the government expects a lump sum, basically a bribe. Even after being employed, receiving a stable paycheck is something unheard of in Gyumri. There isn’t enough money to go around, as Digin Lilig put it. A major problem with the government in Gyumri, and Armenia in general, is corruption. Everything seems to run on connections and bribery. One example she brought up was Oasis, a restaurant owned by the Mayor’s brother. The plot of land that the establishment stands on was public property and was in fact a park for the citizens of Gyumri. With his connections, however, the owner took the land as his own and built his business. An even worse example of such corruption is the case with Digin Lilig’s daughter. Thinking she had been accepted to a university, Digin Lilig’s family went to the orientation at school. Their excitement and celebration soon turned into dismay and frustration as they realized that they were falsely informed of their daughter’s acceptance. They had to pay an exorbitant “fee” in order to expect any sort of fair service. I was the first to find out about this terrible event as Digin Lilig began crying on my shoulder one morning. An always cheerful lady had been left in confusion and dismay. After several parents complained and with some extra payments, her daughter was able to register for classes. Digin Lilig explained the difficulties in advancing in such a place with corruption and bribery, a place without a clear sense of what is and isn’t fair. She also explained how starting a business in Gyumri is vital. These businesses aren’t what you would imagine but instead are home-operated endeavors. Selling fresh lavash or other homemade goods is a great way to make extra money. 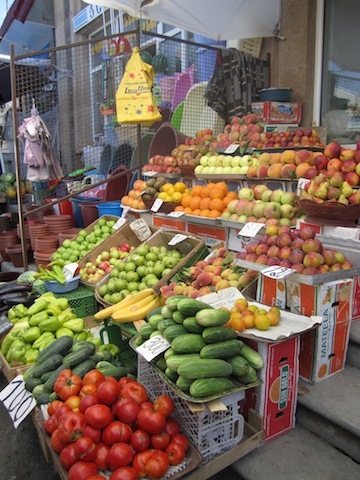 Things such as gas, electricity, flour, meat, water, and fruit, have tripled in price recently. Digin Lilig explained that water, a previously free good, is now an added expense. Making a simple meal at home requires calculations from the gas used to the grain of salt. During the winter, she explained, her family gathers around the stove in the kitchen to stay warm because heating the house for one month would cost her almost that entire month’s income. Imagine the freezing temperature and her house being surrounded by snow, and picture a family of five huddling around a tiny stove for months. Healthcare was another topic we discussed. Even though technically healthcare in Armenia is free, getting special work done or operations are quite expensive. Not only do patients pay for their service, but also have to give an addition “fee” to the doctors and nurses. The lack of income and supplies make doctors less than thrilled to work, which provides for poor quality healthcare. Doctors do range in prices but as prices decrease, so does the quality of the doctor. With incomes being low, doctors will do anything to make an extra dollar, even if it means giving their patients the wrong medicine. More and more doctors are lowering the quality of their work and most simply are not qualified to even be running an office. Operations are costly so if one can afford it great, if not then good luck. The concept of taking out a loan or borrowing money is foreign to them. They either have the money to afford their necessities or they go without them. 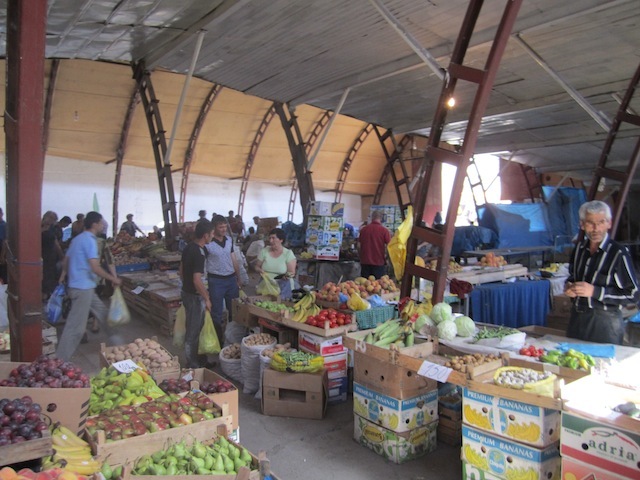 Life in Armenia, Gyumri specifically, has become very costly for its citizens. Individuals simply do not make enough money to sustain a comfortable living. With prices increasing and employment decreasing, more and more people find themselves in difficult situations. Unfortunately, financial instability and poverty aren’t their only worries. With a lack of leadership, corruption being rampant, and an incomplete sense of fairness and equality, their problems stack up and their cost of living in Armenia increases. After hearing about such hardships and the amount of distress these people face, my mood quickly changed. Digin Lilig realized this and brought up one important fact. Although they endure hardships, she said, Armenia is their homeland. Having independence and calling the land their own makes it special and something worth any hardship. To this day, she explained, most people living in Gyumri still greet everyone with a smile. Although some brides go to Russia to get married off and some men go to France to find jobs and get government aid, many stay in Gyumri… why? Specifically for her, it would be too difficult to move at this stage in her life. With three grown children, moving to another country and starting out fresh would not be the easiest of tasks. This is her home, their home. She explained that having a homeland gives them a sense of ownership and security, and unites the diaspora under one common cause. Everyone knows they have a homeland to go to, a place of their own. They are struggling yes, but struggling not only for themselves but also for the future of Armenia. The people themselves are ready for a change, a change in the corrupted government whose sole purpose is to fill the pockets of politicians while their own citizens live in high poverty, a change in the economic climate of Armenia, and a change in their daily lives in terms of stability and comfort. Rabid post-independence capitalism brought hardships to Armenia but now, Digin Lilig explains, citizens have a sense of ownership of their belongings and have an incentive to advance in their homeland. After hearing about one depressing topic after another, I was shocked to hear of such positivity and of how much love she has for her homeland. These uplifting attitudes despite their hardships made visiting Armenia, and especially Gyumri, an inspiring experience. Being happy with so little is not a concept known in America but was refreshing to see in Armenia. The love they have for their country is uplifting. As Digin Lilig said, we all work towards one cause; Armenia unites us all. Witnessing all of this, and after hearing so many stories, I return with an even greater sense of responsibility. I also return with gratitude for how much Armenia has taught me and am glad that our dreams and hopes for a better and prosperous Armenia do not stop in the diaspora but continue all throughout our homeland.